An Environment Canada official confirmed that a tornado touched down in Calgary as a firece storm ripped through several southwest communities Wednesday night. There were "numerous reports of funnel clouds across the city as the system developed," said Bill McMurtry. "As it moved across the western part of the city, it appears we did have a brief touchdown of a tornado." The storm, which hit just after 7 p.m., blew cars onto sidewalks, toppled road signs, ripped shingles off houses and uprooted trees, witnesses said. Some said it lasted for only 10 seconds. There were no reports of injuries. 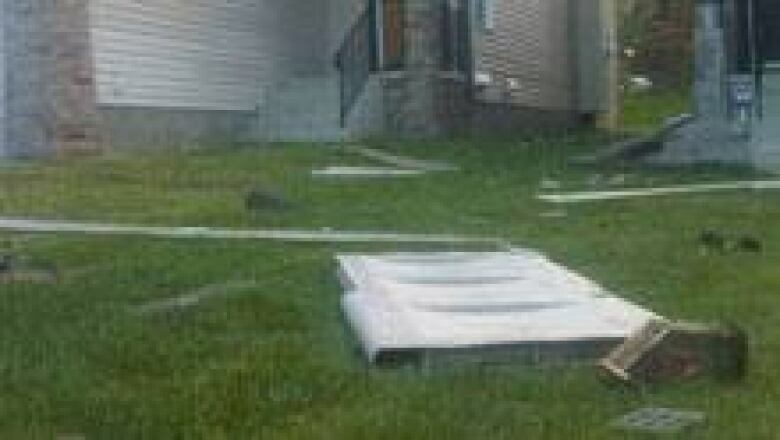 Environment Canada said the tornado was an F0, the weakest of all twisters with wind speeds between 64 km/h and 115 km/h. It was the ninth tornado to hit Calgary in the last 40 years. Southwest resident Melanie Smith said she saw the twister take shape. "Initially it didn't touch down," she said. "But it kept getting stronger … then as it moved over some of the fields, we saw small twists on the ground and the winds got stronger. So I did see it touch down a little bit but it picked up right away." Another resident said she took cover as the storm got worse. "It was scary, it just got really windy and the entire house started to shake, so I just hid in my pantry," said Jenna Mcleod. If they see a tornado, people are advised to seek shelter in basements, or, at the very least, in the interior rooms of homes, McMurtry said. Above all, stay away from windows and exterior walls, he said. "It's not the wind of the tornado that injures or kills you, it's the debris that the wind will throw at you," he said.